Heat oven to 400°F. Place pie crust in 9-inch glass pie plate as directed on box for One-Crust Filled Pie. DO NOT PRICK CRUST. Bake 8 to 10 minutes or just until edge begins to brown (if crust puffs up in center, gently push down with back of wooden spoon). Meanwhile, in medium bowl, beat eggs, milk, flour and Parmesan cheese with wire whisk until well blended. 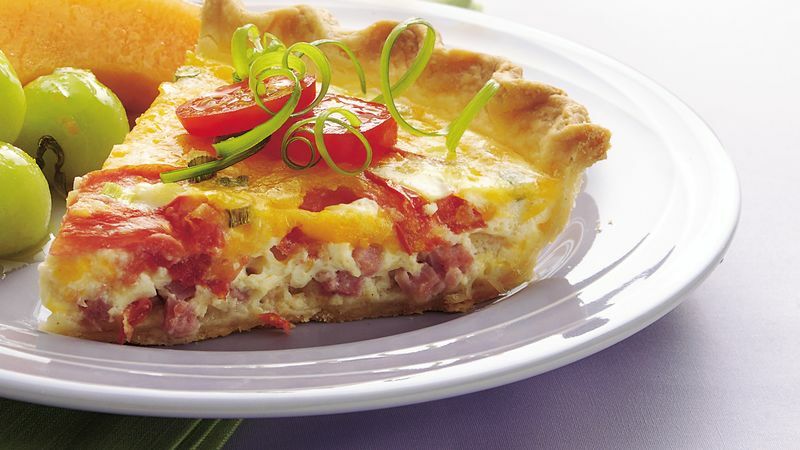 Layer ham, tomato, onions and Cheddar cheese in partially baked crust. Pour egg mixture over layers. Cover crust edge with strips of foil to prevent excessive browning; bake 25 to 35 minutes or until golden brown and knife inserted in center comes out clean. Let stand 10 minutes before serving. To add a special touch, garnish the top of the quiche with sliced cherry tomatoes and a pretty green onion fan.